Right-click on the download link above and select Save Target As....(Internet Explorer), Save Link As..... (Firefox), Save Link As..... (Google Chrome), Download Linked File..... (Safari). The file will then start downloading to your PC. When it has finished double click on the downloaded .exe file to run it. You might see an Open File Warning window that looks something like the image below. 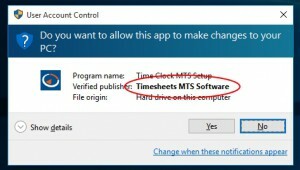 The warning message may vary but the file is safe to open and run if it is signed by Timesheets MTS Software (us!). Follow the Time Clock MTS installer instructions to install the software. If you need more help you should take a look at our detailed instructions to help you download Time Clock MTS and install Time Clock MTS. Start Time Clock MTS from the Windows Start menu, or from the shortcut you optionally installed on your desktop when you installed Time Clock MTS.